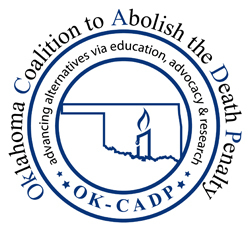 OKLAHOMA CITY, OK – Sociology professor and author, Dr. Susan Sharp Crow addressed over 100 attendees during the Oklahoma Coalition to Abolish the Death Penalty’s (OK-CADP) 27th Annual Meeting and Awards Dinner on April 21. 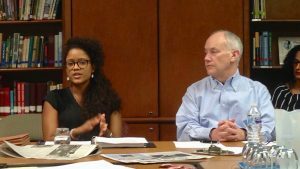 Her keynote speech explored the serious concerns about race and the death penalty. Sharp Crow is a David Ross Boyd professor emerita of sociology and L.J. Semrod Presidential professor of sociology at the University of Oklahoma. 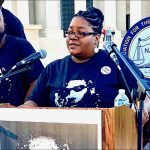 Her work has focused on the impact of criminal justice policies on families of offenders, women prisoners, and capital punishment. A former board member of the American Society of Criminology (ASC) and former chair of the Division on Women and Crime of the ASC, she is currently associate editor of the ASC newsletter, The Criminologist. Susan served as OK-CADP Chair from 2002- 2004 and was named the group’s Phil Wahl Abolitionist of the Year in 2004. Giving an overview from the slavery era until today, Susan discussed her findings for the Oklahoma Death Penalty Review on Race and the Death Penalty in Oklahoma. In 2015, Dr. Sharp Crow, Dr. Michael Radelet (Professor of Sociology and Faculty Associate, University of Colorado-Boulder), and Dr. Glenn Pierce (Principal Research Scientist in Northeastern University’s School of Criminology and Criminal Justice) collaborated with The Constitution Project on the first ever study of its kind, the Oklahoma Death Penalty Review Commission, to provide data on racial disparities in applying the death penalty in Oklahoma. Their research was incorporated into the Commission’s final report. Based on the draft of that study, Julius Darius Jones and Tremane Wood, two African Americans on Oklahoma’s death row, have argued that the state’s death penalty unconstitutionally discriminates on the basis of race. Sharp Crow provided an update that Julius’s case had been reconferenced, or deferred until a later date, in the Supreme Court for the fifth time. Arizona Assistant Federal Public Defender Amanda Bass, attorney for Julius Jones, noted that the case has since been reconferenced once again. Oklahoma has had a moratorium on the death penalty since October 2015 after the wrong drug, (potassium acetate instead of potassium chloride) was nearly used to execute Richard Glossip. The Oklahoma DOC is currently working with Attorney General Mike Hunter’s office to develop a new death penalty protocol using nitrogen hypoxia, or inert gas inhalation (IGI). Until the new protocol is in place, all executions will remain on hold. 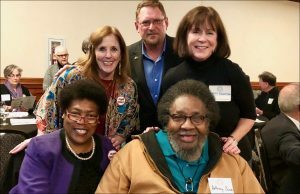 Special guests in attendance were Madeline and Anthony Jones, parents of Julius Jones; Nancy Vollertsen, sister of the late Oklahoma death row exoneree Greg Wilhoit; and Linda Toure, wife of the late Opio Toure, a former Oklahoma state representative, attorney, and longtime anti-death penalty advocate. Board member Margaret Cox announced the seven at-large board members elected that evening for the 2018-2019 term: Leslie Fitzhugh, Connie Johnson, Rev. Theodis Manning, Dr. Elizabeth Overman, Dr. Gilbert Parks, Jim Rowan and herself. Prior to joining the Western District Federal Public Defender Office in 1996, Bauman served with the Oklahoma’s Death Penalty Resource Center for four years. Randy works with OK-CADP to facilitate the continuing education of local capital defense attorneys through the Bob Lemon Capital Defense Attorney Scholarship Fund, which he helped to establish. 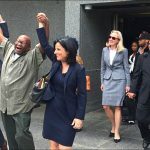 The supervisor of Oklahoma’s Capital Habeas Unit, Bauman has worked to defend Oklahoma death row clients for over 25 years. Event sponsors include First Unitarian Church of Oklahoma City, St. Charles Borromeo Catholic Church, Bob Lemon Memorial Peace House, The City Sentinel, Jim Rowan, Edmond Trinity Christian Church, and Charities of Oklahoma City. To read the original story, visit The City Sentinel.